Oprah dismissed rumors of tension between her and Rosie O'Donnell, taking to Twitter on Wednesday to say that the rumors were baseless. O'Donnell is starting a daytime talk show on Oprah's OWN network. But Popeater alleged that the two are clashing over the direction of the show. The site claims that O'Donnell wants the show to have a distinct political orientation, whereas Oprah wants to avoid the controversies O'Donnell got herself into on "The View" and stick with less polarizing fare. 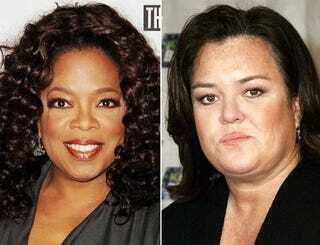 In response, Oprah tweeted, "There's no feud between Rosie and me. We haven't even had a discussion about her new show" (O'Donnell confirmed this). Oprah then added, "I get so sick of people trying to create fights and feuds when women are in business. Don't buy into it." The message might have been more convincing if she hadn't recently reminded us of her beef with Iyanla Vanzant and her years-long misunderstanding with Whoopi Goldberg. But Oprah reportedly told Fortune magazine that she'd done a "crazy check" on O'Donnell before agreeing to work with her (and it cleared), so hopefully the two really are OK and the show will go on. In other news: Employer Demands Facebook Password Before Hiring.